Mahavir Jayanti is one of the very important days marked by the Jain community. Mahavir Jayanti marks the birth of Vardhaman Mahavir, the twenty-fourth and last Tirthankara who revived the religion of Jainism. Mahavir Jayanti 2019 will be celebrated on April 17 this year. Jains all over the globe mark this day and it has a very deep significance for people of the community. Lord Mahavir practised intense meditation for more than 10 years and achieved Kevala Jnana ie omniscience. His teachings are very impactful to people who follow the faith. He preached on love, respect and kindness to every creature, including the microorganisms. Mahavir Jayanti 2019: Information and Facts About The 24th Tirthankara of Jains. Lord Mahavir followed an ascetic lifestyle of intense medication of 12 years which helped in attaining supreme wisdom about the world. Based on the discourse of the Tirthankara, Agamas are formed. The Agama is a series of beginning-less, endless and fixed truths, without any origin, human or divine. So the five vows of Jainism which every person of the community should observe are Ahimsa (Non-violence), Satya (Truth), Asteya (no stealing), Brahmacharya (Chastity) and Aparigraha (Non-attachment). 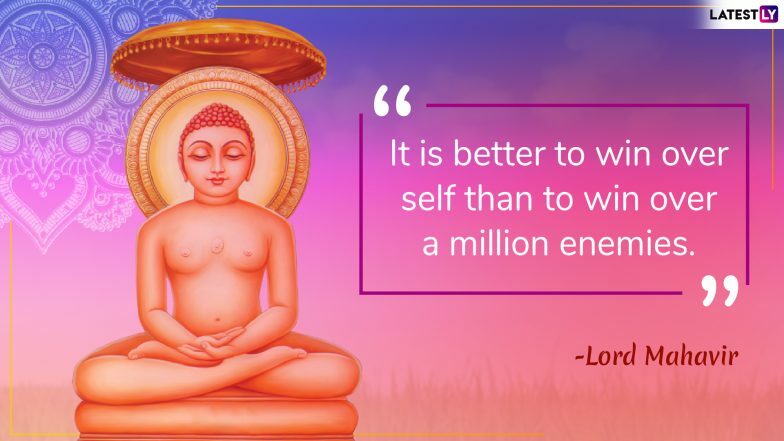 Here are some more teachings and quotes of Lord Mahavir. The quotes by Lord Mahavir prove his belief in love and kindness towards everyone. He preached on self-control and non-violence. To celebrate this day, people undertake some charitable work. Some even observe a fast on this day. The Jain temples see a lot of devotees coming to pay respects, especially on this day. In several places, rallies are also carried out preaching Mahaveer's messages and teachings.